Group 14 comprises of carbon, silicon, germanium, tin and lead. This is the first group in which the transition from non-metals, C and Si via typical metalloid, Ge, to weakly electropositive metals, Sn and Pb, can be clearly observed. Though, this doesn't imply that the properties of carbon are fully non-metallic; its crystalline forms are lustrous, one allotrope (like graphite) conducts electricity. Tin and lead, on the other hand, make amphoteric oxides and volatile chlorides. Each and every elements of this group are significant in some manner or another. As carbon is the necessary constituent of all living beings, silicon is present in rocks and also many minerals. Both silicon and germanium are vital components of semiconductors and transistors. Tin and lead as well find out different uses in everyday life. Amongst all the elements of this group, carbon is the only one to take place in the elemental state as diamond and graphite. These are the two naturally occurring allotropic forms of carbon. As illustrated above, carbon, in the combined form, is a necessary constituent of all the living systems. The inorganic carbonates of sodium, calcium and magnesium are largely distributed in the rocks, soil and water. Air comprises around 0.03% of carbon-dioxide. Coal and petroleum, that are termed as fossil fuels, because of their origin from the prehistoric plant and animal life, are the mixtures of complex compounds of carbon with hydrogen having small amounts of sulphur or oxygen. Silicon is the second richest element in the earth's crust forming around 27.7%. Oxygen with its relative abundance of around 46.6% ranks first. The Silicates are present in the rocks. Clays are basically alumino-silicates of Na or Ca. Common sand is the impure form of silica. Glass that is a mixture of silicates has been acknowledged since antiquity. Germanium is an exceptional element. It takes place in traces in coal, in rare mineral argyrodite, 4Ag2S.GeS2, in germanite, Cu3(Ge,Fe)S4, and as admixture in zinc and tin ores. Tin takes place mostly as cassiterite or tin stone, SnO2 and lead as galena, PbS. Most of the elements exist in more than one form. These forms are termed as allotropes, and the phenomenon is termed as allotropy. The two common allotropic forms of carbon, that is, diamond and graphite are renowned. These are, however, giant macromolecules comprising of 'C' atoms linked via a network of covalent bonds (figure shown below). Each and every carbon in diamond is tetrahedrally bonded to 4 other carbons by a bond distance of 154 pm. Here you might note that SiC as well consist of the similar structure however the alternate atom in it is Si in place of carbon. In diamond, the strong covalent bonds formed in the huge macromolecule result in a structure that is without any mobile electrons and therefore it acts as an insulator. 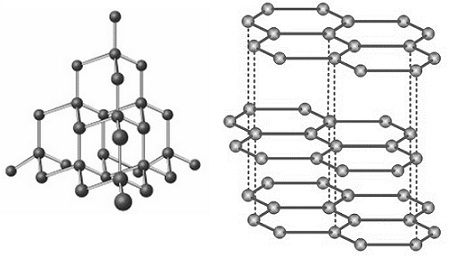 The rigid, (3-D) three dimensional linkages make diamond one of the hardest substances identified. In contrary to diamond, graphite is extremely soft as it consists of a (2-D) two dimensional sheet structure having regular planar hexagons. The bond length is 142 pm exhibiting some multiple bond character, intermediate between a double and a single bond. Various layers are at a distance of 335 pm from one other and are therefore held by weak van der Waals forces only. Such layers can slide over one other easily, imparting softness to graphite. In graphite, each and every carbon forms three bonds by other carbon atoms leaving one electron that is delocalized over the entire planar structure. Such delocalized electrons make graphite a good conductor of electricity. Metallic lustre can as well be attributed to these delocalized electrons. Carbon exists in the amorphous form as well; for illustration, as lampblack. Lead, again, exists only in one crystalline form which consists of a distorted cubic close packed structure. As stated above, diamond and graphite take place in nature. Though, diamond can as well be made up whenever carbon is subjected to high temperature and pressure. Moissan (1896) got artificial diamonds via quick quenching of a solution of carbon in iron. The rapid expansion of iron led to tremendous pressure that resulted in the separation of carbon in the crystalline form, however small in size, such artificial diamonds find out numerous uses in industry. Artificial graphite can be manufactured on a huge scale by heating coke by silica at ~2775/K for 25-35 hours. Three other forms of carbon are prepared on a large scale due to their vast industrial uses. These are coke, charcoal and carbon black or lamp-black. The first two are made up by the destructive distillation or pyrolysis of coal and hardwood or bones in the lack of air. Carbon black is made up whenever petroleum gases or natural gas is burnt in a limited supply of air. Commercial form of silicon is attained via reduction of SiO2 by C or CaC2 in an electric furnace. High purity silicon is attained either from SiCl4 or from SiHCl3. Such volatile compounds are purified via exhaustive fractional distillation and then reduced by very pure Zn or Mg. The resultant spongy Si is incited, grown to cylindrical single crystals, and then purified via zone refining. Ge is as well attained by the reduction of GeO2 by C or H2. Tin is attained by the reduction of its oxide with carbon. Lead is generally obtained from PbS. The ore is roasted in air to provide the oxide which is then mixed by coke and limestone and decreased in a blast furnace. Diamonds are mainly employed in jewellery on account of their high refractive and dispersive power. Due to their remarkably hard nature, inferior quality diamonds are employed for industrial purposes mostly in the form of grit and powder in cutting, drilling, grinding and polishing the tools. Graphite electrodes are employed in the extraction of aluminium. Graphite is as well employed for making crucibles, as a lubricant in the heavy machines and as pencil lead and so on. Very pure graphite is employed as a neutron moderator in nuclear reactors. Coke is mostly employed in metallurgy. Carbon black is employed to strengthen the rubber, as a pigment in inks, paper, paints and plastics. Activated carbon comprises of huge surface area and is employed widely in sugar industry as a decolorizing agent. Amongst the compounds of carbon, CO2 finds a significant use as a fire extinguisher and in refrigeration as dry ice. Silicon discovers uses in both the elemental and combined forms. Very pure silicon is employed in making semiconductors and in the solar cells that are becoming increasingly significant. Hyperfine Si is one of the purest materials employed in the production of transistors. Silicates are employed in glass and cement manufacture. Silicones are as well broadly employed as lubricants. Their inert nature makes them ideal for utilization in gas chromatography, example: methyl phenyl silicones. Germanium is mainly employed in transistor technology. Though, its use in optics is growing; germanium is transparent in infrared region and is, thus, employed in the infrared windows, prisms and lenses. Due to its resistance to corrosion, tin is mainly employed to coat mild steel plate. Tinning of copper and brass vessels has been an age old practice in India. Tin is as well used for making different alloys such as bronze, pewter, gun metal and so on. Tin-lead alloys are fusible and low melting. Solders that are low melting alloys are employed to join pieces of metal altogether. Soldering is an extremely common practice for joining the components of an integrated circuit. Sn-Pb alloys arc as well employed as bearing metal or type metal. Lead is employed as an inert material, example - for building roofs and for cable sheathing. Lead gets covered by a layer of PbSO4 that is insoluble and doesn't get attacked via common reagents. Lead pipes were employed in municipal water supply at one time. Soft water, though, tends to dissolve lead and might cause lead poisoning. Thus, galvanized iron (GI) pipes are now employed for water supply. Because of their low chemical reactivity, lead coated chambers are employed in numerous industrial preparations like that of sulphuric acid. In view of its high density, lead is as well employed in making shielding blocks for radioactivity experiments. Organolead compounds, example - tetraethyl lead, Et4Pb and tetramethyl lead, Me4Pb, are employed as antiknock additives to petrol for internal combustion engines. Though, in recent times, due to their polluting nature, most of the countries have reduced or altogether stopped their use. One of the main uses of lead still is in the storage batteries. Storage batteries as well termed as lead-acid batteries encompass a supporting grid of lead-tin alloy (91:9) having PbO2 as the oxidising agent and spongy Pb as the reducing agent. The electrolyte is dilute H2SO4. The outer shell electronic configuration of each and every elements of group 14 is given in the table shown below. It exhibits that the elements of this group can acquire a closed shell configuration by gain, loss or sharing of four electrons. Thus, they might be expected to illustrate a valency of four. Let us now discuss their physical properties, chemical properties and some of their significant compounds. You should have observed in case of Group 13, that p-block elements exhibit more than one stable oxidation state. The elements of Group 14 exhibit oxidation states of +2 and +4, which are as well the valences represented by these elements, apart from carbon where oxidation state differs from -4 to +4. Though, the valency and the stable oxidation state for a given element might not be similar. Valency, as you be familiar with, can be stated in terms of the number of electrons lost, gained or shared in the bond formation. The oxidation state or oxidation number, on the other hand, is equivalent to the charge the atom would encompass if all the electrons in a covalent bond it forms were assigned to the more electronegative atom in the bond. Table illustrated below provides some simple rules to figure out the oxidation state. The ionization energies (table shown above) point out that a very large amount of energy is needed to form a M4+ ion, thus, not most of the ionic compounds are made up by Group 14 elements in the +4 oxidation state. On the other hand, the promotion of one of the ns electrons to the np vacant orbital, as illustrated below, can let a tetra-covalency. However, most of the tetravalent compounds made up by elements of this group are covalent in nature. The electronic configuration of carbon in the ground and excited state is provided as an illustration. As we go down the group, the stability of +4 oxidation state reduces; the heavier elements of the group encompass a tendency to change from +4 to +2 states. This is reflected in the oxidising power of their tetravalent compounds. For illustration, CO2, SiO2 and GeO2 don't act as oxidants; SnO2 is a mild oxidising agent whereas PbO2 is a strong one. However, stannous salts are the reducing agents. The tendency to form ionic compounds in the +2 oxidation state rises as we go down the group; PbF2 and PbCl2 are well stated ionic compounds. The increasing stability of the divalent state down the group, particularly in the case of lead compounds is featured to the 'inert pair effect'. This effect has been attributed to an increase in the stability of ns2 electrons in the ionic compounds. Though, the higher stability of covalent compounds like tetra alkyl lead, R4Pb, compared to the dialkyllead species, R2Pb, points to the ready participation of the 's' pair electrons in covalently bonded tetravalent compounds of such elements. As the sum of first two ionization energies as well decreases down the group, it becomes increasingly favorable thermodynamically, for Sn and Pb to form compounds in oxidation state +2 that are more ionic in character. The covalent radii of elements, as expected, increase with the increase in atomic number. This increase, though, is not uniform. You may have noticed in the above table that when we move from carbon to silicon the covalent radius rises sharply, and then the increase is steady. This can be illustrated as follows. A big increase in the size of silicon is due to the introduction of the 3rd shell. Whenever we go down to germanium, the 4th shell is introduced, no doubt, however the effective nuclear charge resultant from addition of eighteen protons to the nucleus outbalances the effect of the additional shell leading to just a marginal increase in size. Likewise, in case of Pb, the increase in covalent radius is extremely small in comparison to that in Sn. This is further reflected in the ionization energies and electron affinities of such elements. Going from beginning to end the data given in the first table, we will notice that carbon has higher electronegativity as compared to the other elements of group. As an outcome, it can accept (or gain) electrons and can form negative ions of the type C-2, in acetylides and C4- in methanides, whereas the other elements in the group are not able to do so. Whenever we notice the electronegativity trends in the group, we find out that the value reduces down the group as expected, with Ge as an exception whose electronegativity is slightly higher than that of Si. As illustrated above, this could be due to the higher efficient nuclear charge in case of Ge. Whenever we go through the data for ionization energies given in the first table, we find out that the first and second ionization energies reduce down the group from C to Sn as expected, however they increase slightly whenever we move to Pb. On the other hand, both the 3rd and 4th ionization energies differ irregularly, their sequence is C > Go > Si > Pb > Sn. The decrease in the 1st and 2nd ionization energies from C to Sn is due to the reason of the increase in atomic size down the group. The 3rd and 4th ionization energies increase from Si to Ge due to poor shielding of 4s electrons offered by the 3d electrons against the increased nuclear charge in Ge. The whole ionization energies are slightly higher in case of Pb. This increase can again be featured to the poor shielding effect of the 4f and 5d orbital electrons. Moreover, the s-electrons being more penetrating, experience higher nuclear charge that makes it hard to eradicate them. In Group 14, carbon is the only element able of making comparatively stables multiple bonds by another C atom and as well by N, O and so on. Illustrations are alkenes, alkynes, imines, nitriles, ketones and so on. None of the other elements of the group forms stable compounds containing multiple bonds. The tendency of formation of multiple bonds without difficulty, in case of carbon, is due to the high bond energy and a small atomic radius of carbon as compared to other elements of the group. Therefore its p-orbitals can approach the p-orbitals of the other C, O or N atom for the efficient overlap necessary for π-bond formation. In case of (SiH3)3N, the pz orbital of N having a lone pair overlaps by the empty d-orbital of silicon and makes a 7r-bond. It might be noted that p2 orbital of N consists of energy comparable to d-orbital of Si. This type of a π bond is termed as pπ-dπ bond. As donation of lone pair is in the molecule, this is termed as internal π-bonding. This kind of bonding is possible to some extent in Ge however not in case of Sn and Pb. As C doesn't have any d orbitals, thus, it doesn't exhibit this kind of bonding. Catenation is the property by virtue of which elements form long chain compounds via single or multiple bond formation between the atoms of similar element. Carbon illustrates this tendency to a remarkable extent due to its small size and high bond energy, Si and Ge to a lesser extent and Sn and Pb to a very small extent. A few illustrations of their hydrides and halides can be cited here. In case of carbon we have alkanes, example - ethane, propane, butane, pentane and so on. These are the chains of carbon hydrides having the general formula CnH2n+2, where 'n' can be a large number, alkanes having n = 100 are known. Carbon as well forms a number of catenated halides, example - polyvinylchloride (PVC). Silicon forms silanes having the general formula SinH2n+2, however 'n' doesn't exceed 8. Its halides as well exhibit catenation and encompass a general formula SinX2n+2, where if X=F, n=l-14; if X=C1, Br or I, n= 1-10. Germanium forms germanes, having general formula GenH2n+2, where n = l - 9. Germanium halides form dimers, example - Ge2Cl6. Hydrides of Sn and Pb are much less stable, whereas SnH4 and Sn2H6 have been made; analogous methods fail for the preparation of PbH4. No catenated halides are identified for Sn and Pb.